He's been semi-retired the past couple of seasons before deciding to come back for one last crack before retiring to focus on work. 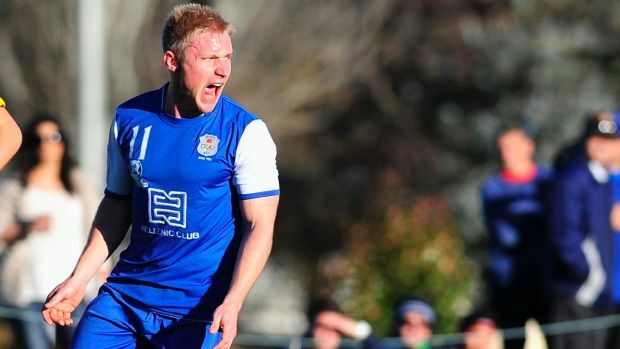 Now Canberra Olympic forward Oliver Wiederkehr hopes his FFA Cup dream extends beyond their semi-final date with A-League glamour side Sydney FC. Olympic are the $11 underdogs carrying the hopes of semi-professional players from around the country. They're enjoying the club's best ever season in their 60-year history, claiming the minor premiership, premiership and Federation Cup before embarking on their dream run through the FFA Cup. Wiederkehr has been at the club for the past 10 years, but for the past few seasons he's started to focus on his personal training, which has made it hard to fully commit to soccer. But the 28-year-old decided to give it one last crack before he throws himself fully into his work. He knew some of his teammates were going overseas during the season so felt it was the perfect opportunity to go around one more time. "It's been a dream really. I don't think anyone in the team would've thought that we'd be here, especially going this far into the season," Wiederkehr said. "You do have to pinch yourself to realise where we are and the opportunity that we have. Taking Sydney on is going to be something that's going to be really special. "We keep saying it doesn't really matter what happens, but it'd be really nice to go one further and have a crack at the FFA Cup final." While he was born in Switzerland, Wiederkehr's introduction to Australia couldn't be any more Aussie. His parents came Down Under for a holiday when he was three – travelling around Australia in a Kombi van. Despite their trip getting cut short when his father got sick, they loved it so much they migrated to Coffs Harbour two years later. "When I was three we travelled around Australia for a bit of a holiday for about six months in a little Kombi van with just my mum and dad and myself," he said. "We flew into Brisbane and travelled down the coast and made it somewhat to Adelaide. "My dad got sick, which was the reason we went back early, but they loved it so much that we moved back over here two years later and never looked back. "We went to Alice Springs and Coober Pedy, but largely did the coast. I have vague memories of that trip when I was younger." Now he's hoping to make some special FFA Cup memories. Wednesday: Canberra Olympic v Sydney FC at Viking Park, 7.30pm. Tickets available from Eventopia.